Viewing Album: Bethlehem engine terminal’s transition from Alco’s and EMD switchers, part 1. 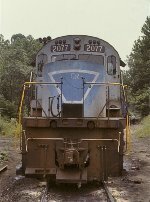 Album Info: In Part 1: From a Lehigh Valley Alco and EMD switcher home, the Bethlehem, Pa engine terminal saw a transition away from RS11’s, SW8’s, SD9’s, and GP7’s after July, 1979. In Part 2: By May, 1982, an RS3M, an ex-RDG GP7, and LV and EL EMD switchers were idle. 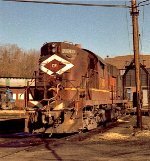 In 1988, Bethlehem’s local traffic and yard chores were being handled by EMD workhorse GP38’s and GP38-2’s. In nearby Easton, former LV and CNJ tracks and bridges were quiet and appeared long idled. Description: Former LV short hood RS11 7612 leads a trio of RS11's and a caboose mate at Allentown yard. Description: PC SD9 6909 and CR-stenciled 6908 work Allentown yard. 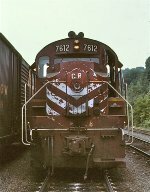 Description: The engineer gives the photographer a look as PC SD9 6909 and CR-stenciled 6908 work Allentown yard. Description: Former LV short hood RS11 7612 leads a trio of RS11's at Allentown yard. Description: Former LV short hood RS11 7612 leads a trio of RS11s and a caboose mate at Allentown yard. Description: Former LV RS11 7642 runs in the middle of a trio of RS11s working Allentown yard. Description: Former LV RS11 7640 runs in a trio of RS11's working Allentown yard. Description: Former LV RS11 7642 runs in the middle of a trio of RS11's working Allentown yard. Description: A trio of former LV RS11's work Allentown yard. 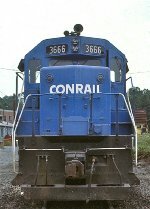 Description: CR GP35 3666 (ex-EL 2560) at the Bethlehem engine terminal. Description: Former LV RS11 7641 on the Bethlehem turntable tracks. Description: CR SD40 6301 rests at the Bethlehem engine terminal. Description: Former LV RS11 7641 prepares for work with C420 2077 on the Bethlehem turntable tracks. Description: Former LV RS11 7641 at the Bethlehem engine terminal. 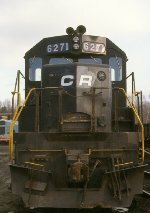 Description: CR B23-7 1914 waits for assignment at the Bethlehem engine terminal. Description: CR SD45s 6170 and 6154 wait for assignment at the Bethlehem engine terminal. Description: CR SD45's 6170 and 6154 wait for assignment at the Bethlehem engine terminal. Description: Former RDG GP35 3651 moves through the Bethlehem engine terminal. Description: CR U25B 2500 rests on the turntable tracks at Bethlehem. 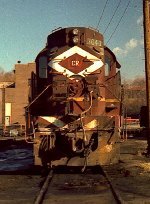 Description: CR SD40 6271 at Bethlehem. Description: Former LV RS11 7640 rests on the Bethlehem turntable tracks. Scanned from negative. Description: The "LV" is visible in the diamond of RS11 7640 at Bethlehem. Scanned from negative. Description: Former LV RS11 7640 on the Bethlehem turntable tracks. Scanned from negative. Description: CR SW8 8683 moves a careful military load at Allentown yard. 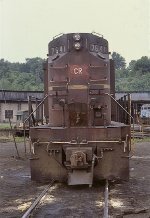 Description: CR U33C 6541 works Allentown yard.